Holding nothing back, Hit The Lights’ latest track is an upbeat, hook-filled pop-punk anthem that listeners everywhere are sure to relate to. “No Filter” follows the band’s recently released track “F*ucked Up Kids,” which sparked mass excitement and buzz about the bands upcoming fourth album. 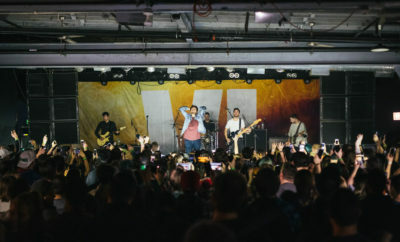 Hit The Lights will be taking their record on the road this spring with dates in the UK on the Pure Noise Tour (featuring Four Year Strong, Forever Came Calling and Light You Up) in March and will return to the U.S. in April for a tour with Cartel and Driver Friendly. Follow the band at https://www.facebook.com/HitTheLightsMusic for additional information. ← Previous Story WATCH: New music video from Halestorm! Next Story → Performers Announced for ACM Party for a Cause Festival / ACM Presents: Superstar Duets! Bahari Debut Single and Announce Tour Dates! The Head and The Heart Announces U.S. Tour!